Dan Brown has drawn a lot of fire for torturing the truth to build the plot for The Da Vinci Code. But I’ve yet to see anyone focus on the book’s three truly fatal flaws. Detail from Da Vinci’s The Last Supper. 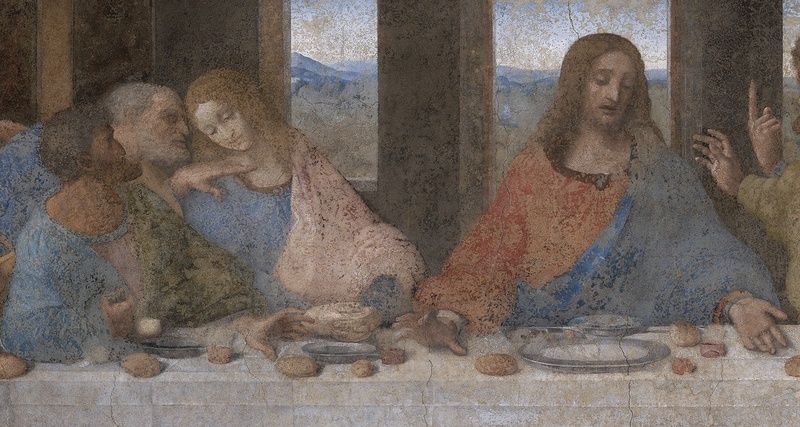 One of the book’s legitimate points is that Da Vinci’s John the Apostle, the blonde next to Jesus, looks like a woman. Secret #2: The Church and the Priory of Sion (a pagan cult) know about Jesus and Mary Magdalene, and they’ve been keeping the secret from the rest of the world for two thousand years. The Church wants to bury the secret and the Priory wants to preserve the evidence, to reveal the secret at some future date. This double conspiracy theory has a lot of small problems, as well as three so gigantic that there’s no way around. A Secret Known to Dozens or More in Every Generation for 2,000 Years Can’t Remain Secret: The Da Vinci Code tells us that the Church’s leadership and the Priory of Sion have known the Mary Magdalene secret since the time of the apostles, but they’ve kept it from the rest of the world. No way. Every time someone new learns a secret — every time you add someone to the conspiracy — you increase the chance of exposure. Time increases the risk too because more years means more chances to spill the beans. We don’t know how many members the Priory has or how many Church leaders know the secret, but it’s got to be dozens at a time for each organization — maybe hundreds. Even if you take a conservative number and guess 50 people know the secret in every generation, that would mean 3,500 people have learned it during the past 2,000 years. That’s just too many. Most governments and corporations can’t protect a secret known by ten people for more than five years. Every time someone has a falling out with the organization’s leaders — or gets drunk or sick, or falls in love with a non-member — you’ve got a chance of exposure. If you’re looking at 3,500 secret-keepers over 2,000 years, the chance of exposure is 100%. The Priory’s Motivation Isn’t Possible; No One “Preserves” A Secret: Some conspirators try to bury secrets, so no one will find out. Others try to find and expose the evidence — to tell the world. The Priory of Sion, however, wants to “preserve” the Mary Magdalene secret, keeping the knowledge alive for thousands of years, but also keeping it from the world. An occasional mental patient might pursue contradictory goals in that way, but not large numbers of people. There Would be no Reason for Jesus’ Daughter to Hide: The secret’s lynchpin is the idea that Jesus’ daughter hid from the Church, and so did all her descendants — because the Church would have killed them to wipe out the secret. But during the apostles’ time, the Church lacked the might, will, and motivation to kill anyone. It wasn’t the power center we now know; it was a small crew of humble and mostly poor people, with no long arm that could send assassins across the Mediterranean to wipe out its enemies. Plus, the early Church had no unified dogma, so alternate beliefs about Christ’s life could co-exist. The Mary/wife story would’ve been just one of many inconsistent stories surrounding the life of Jesus Christ. (It wasn’t until almost 200 C.E. that the Church began insisting that Matthew, Mark, Luke, and John were the only four gospels, and many Christians remained dedicated to alternate gospels for centuries after.) So Jesus’ daughter and the first several generations of her descendants would’ve had no reason to hide and no one to hide from. The Da Vinci Code’s secret bloodline would never have been secret in the first place. The Da Vinci Code is a fun read, largely because the mystery springs from such a juicy, history-laden conspiracy theory. But please don’t take it seriously. Not to mention the fact that the idea that jesus being able to procreate would disprove his divinity doesn’t make any sense, giving that pagan gods had children all the time with no one saying ‘hold on! That god had a child! That god can’t be a god at all!’ besides I think him eating, drinking and dying are as just as human traits as procreation. Whereas there have been some groups who deny jesus’ human nature (ironically including a group listed as the protectors of jesus’ bloodline), the general consensus is the acceptance of Jesus as being both human and divine. Hold on a second, wouldn’t the descendants of Jesus have wanted to hide from the Romans? The Romans had already killed Jesus and probably regretted it because it just fanned the flames of his ministry and made him a martyr and even more powerful. If I were a descendent of Jesus (and I’m not saying that it isn’t possible, some kind of divine force put me in contact with David Tollen) I’d have hidden from the Romans with the hope that my bloodline would later spring forth and claim some kind of a crown down the line when Christianity was safe. The flaw in that logic is just that although Christianity did prevail generations later the then current leaders of Christianity didn’t want a threat to their leadership and their story so that part of the cover-up would make sense. I don’t think Jesus’s children would’ve had to hide from the Romans. The Romans executed lots of people, and they generally didn’t pursue the unfortunates’ children. Plus, I doubt the Romans cared one way or the other about Jesus and his legacy during the first couple generations after his death. The Roman world was full of mystery cults, and Christianity didn’t particularly stand out among them. Nor did the Romans generally mind these cults. They didn’t target the much larger (and somewhat similar) Isis cult — and they didn’t target Christianity itself until it got pretty big, much later. The Romans didn’t even target Judaism, which was much less flexible about Roman rule, until after two Jewish rebellions. Nor would the existence of Jesus’ daughter have contradicted all the early Christians’ beliefs. A lot of stories about Jesus circulated during the centuries after his death, and the Church didn’t unite around a single narrative for quite a while. All in all, I find the idea of Jesus’ daughter hiding from anyone just plain anachronistic — even if you accept that such a person could even have existed.